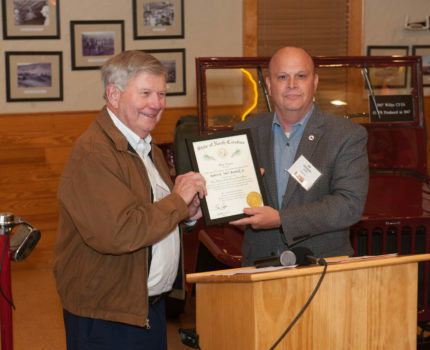 Jim Trogdon, Secretary of North Carolina Department of Transportation, presented Bob Barnhill with the Order of the Long Leaf Pine Award on behalf of Governor Roy Cooper. This is the highest award for state service granted by the Office of the Governor and upon awarding the honor, Secretary Trogdon read an excerpt from William Ralph Emerson’s “A Nation’s Strength” – Not gold but only men can make a people great and strong; Men who for truth and honor’s sake stand fast and suffer long. Brave men who work while others sleep who dare while others fly…They build a nation’s pillar’s deep and lift them to the sky. Congratulations to Bob on this well-deserved honor!